Trying to keep the squirrels from robbing the birdseed is a full-time job. Not only do they steal seeds, they destroy the feeders. 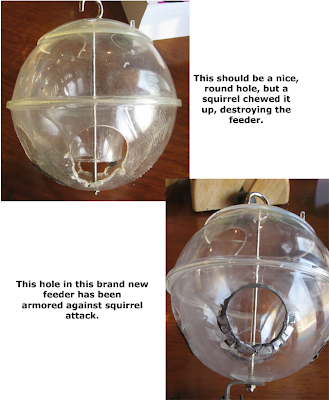 At the top is a feeder that was only two weeks old, destroyed in a day by squirrels. I've armored the feed holes in its replacement, shown at the bottom, with metal, overlaid with J&B Weld metal epoxy. Click the image to view a larger version. Hopefully this will give the squirrels a toothache.